I will be writing this story one paragraph at a time as I find time to do so. As I write the first revision of each paragraph, I will post it to BitBin, Tweet it to the world, and provide you with the link tot he content so you can read the story as it develops. I have to go and take care of some real world family matters, so I will keep this short and provide you with a way to get to the content and how I’m going to lay out future posts with all the links to the content sequentially so you can read the whole thing. As you can see below, there will be links to the the revised editions of the paragraphs. I am wide open to suggestions and corrections of my work. If you decide to send me a revision or correct, include your Bitcoin address if you have one, and I will put yours into the BitBin post so you get credit for the work. When you click on one of the main links (i.e. “Prologue” in this case, you will be redirected to a CoinURL address, just hang tight for a minute and it will redirect you to the BitBin location. The revisions after the main link will go directly to the BitBin location, so older content will bypass CoinURL. I can track statistics using CoinURL and also get paid a small amount of Bitcoin, so it will help me out since our household budget is getting slimmer by the day, and the statistics will tell me the traffic to the content. I also plan on having guest authors that arise from you readers sending me corrections and suggestions. I am hoping that these guest authors might write short stories and novelettes to complement my story line. I imagine this will start happening as my story develops further and things get fleshed out, however, if someone can think of a short story that might describe the lead-in for a character that just appears briefly in my story, then please feel free to send me the outline for your idea, and if you want to proceed to write the story on your own blog and use BitBin and CoinURL the way I use to earn small amounts of Bitcoin in the process, let me know and I will send you a PDF that details how I do it. Once your story is complete, just like I plan on publishing mine as an eBook, I would recommend you publish yours as an eBook as well. I will then publish a blog post and web page that will point to the eBooks. Thanks for reading and I hope to see you return to the blog to read future postings of my developing story. Alright, I’m returning to a subject I am very interested in, and I have covered in a previous post. Riparian buffers are a protective area along water features such as rivers, lakes and ponds that provide protection of the water habitat from off-site pollution, as well as providing habitat for plants and animals that require clean sources of water and food. 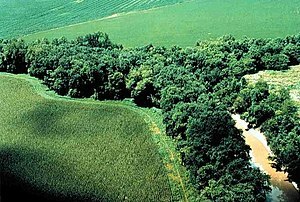 In the previous post I talked about acquiring property along riparian zones, and finding people to live on, and manage those riparian buffer lands. Maybe we need to take this one step further, maybe those of us that believe in such an endeavor should form a union, gather as a folk, or nation, write a constitution, and take possession of riparian buffer lands through legal means, including using angel investors that believe in protecting the environment for future generations. I could envision contiguous buffer zone lands to become small tribal areas, with multiple families assisting each other with the protection management of the riparian buffers they own and control, and these tribes could then cooperate in each bio-regional area to become riparian buffer nations comprising that area, yet all the bio-regional buffer zone nations could also be members of a continental and/or global Riparian Buffer Nation (RBN) that transcend nationalities and all cooperate for the common good of the planet. I envision the tribes to conduct their business a lot like Native American Indians conduct their tribal business. Since these Indian tribes are very connected to their land(s), they already have very well established ways to manage and protect the land and a life style that is connected to the land, and water, and biota on the land, and we can learn a lot from them how to conduct ourselves. So I propose to write a constitution that will focus on protecting the land that provides to us our own life in the form of clean water and uncontaminated food grown in a biota protecting manner so future generations are not stripped of their means of supporting their own and their children. I would venture to say that a few, if not many Native American Indian tribes would welcome such a project, and help us new tribes by teaching us what it means to live in harmony with nature, and maybe become members of the greater Riparian Buffer Nation. Being that I currently live in the USA, but was born in Germany, I have two diverse lifestyles I have lived. Both societies have their good and bad, and it is difficult not the be biased, but I can say the founders of the USA thought far ahead when they wrote the Constitution of the United States of America, so I will make an attempt at writing the first few article of constitution for the Riparian Buffer Nation (RBN) using the US Constitution as my model. So, in future posts I will write up each article of constitution, and if anyone, especially lawyers would like to chime in and make suggestions and/or corrections, I will welcome comments to those posts and if I deem the comments valuable I will incorporate it into the applicable article. I have noticed how when civilization encroaches on the riparian buffer zones, that the watershed always suffers in process, eventually to be reduced to storm water runoff channels and canals. Being someone that can see the environmental impact of people on nature, I am always appalled by the results of civilization. Lately, I have noticed the effect a lot when looking at Google Maps or Google Earth. Lately I have thought I should start a non-profit organisation that finds angel investors that are willing to invest into the non-profit, and use the funds to buy up Riparian Buffers Zones, and hire environmentally aware people to live on these lands and to manage them, gathering runoff from the city and filtering it, catching the nastiness like engine oil and tire dust and other gook, and then using the partially decontaminated water to grow fuel crops on small patches and parcels of the purchased land. In some areas of cities, the runoff ditches would not lend themselves to living on them, but the easement strips along those runoff channels and ditches constantly require mowing and weed management, so they could be used to grow more fuel crops instead, so with some smart water channeling, the runoff water would grow crops, the crops would convert waste water and organic compounds in the water into fertilizer and irrigation, and the fuel crops in turn could be used to run part of the operation’s equipment and vehicles, either in the form of converting the biomass into ethanol to run in E85 vehicles, or turned into Syn-Gas to run electric generation plants which then power some of the operation’s infrastructure. There are other positive side effects to doing this, one of which is turning areas that normally grow invasive or allergy causing weeds that use up precious fossil fuels (for weed control), into areas that produce a product for the amount of fossil fuels utilized to manage the areas, and if managed properly, these areas would not require toxic weed management techniques or supplies, and the land would slowly become less and less toxic as the biological action in the soil can begin to break down the toxic compounds already deposited on the land. Then, if we use IP enabled remote sensors and a WiFi private LAN to manage and record the sensor data, we can monitor and manage the Riparian Buffer Zone(s) with minimal personnel, and concentrate on planting and harvesting fuel crops and improving the environment. Anyway, I needed to record this phase of my though processes, hopefully I can pursue this further in future posts.